I'm eagerly anticipating season 4 of HBO's Big Love, which starts airing this January. 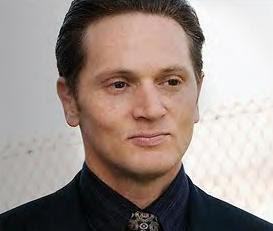 Talented actor Matt Ross (pictured) plays the villainous and closeted Alby Grant on the show. Entertainment Weekly's Michael Ausiello reports that the producers are introducing a controversial "pray the gay away" story line and that it will focus on Alby and his boyfriend Dale (played by actor, Benjamin Koldyke). Producer Marc V. Olsen says "There’s a provocative nature to what we’re doing. It’s more than just the Mormon culture. We’re highlighting certain aspects of the church’s relationship with its gay members that I think, as the story unfolds, is going to cause no [small] amount of controversy." Sounds like fans are in for another great season of drama with our favourite Mormons. I can't wait! AfterElton.com has the first pics of Alby's love interest on the set of "Big Love" here.